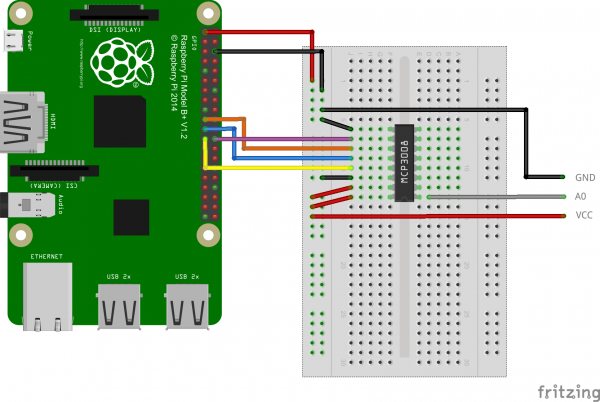 There are some sensors for the Raspberry Pi that can measure humidity, temperature and other values. Nevertheless, these modules are almost exclusively suitable for the air and not intended for use in the earth. For some projects, such as an automatic plant supply, the moisture of the soil must be measured, then, e.g. refilled with water. In this tutorial, I’ll show you how to skip the (analog) humidity reading with a sensor and convert it to a digital value so that the Raspberry Pi can interpret it. 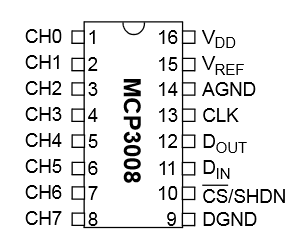 The MCP3008 IC is an analog-to-digital converter. Since the Raspberry Pi cannot detect intrinsically analog signals, you need a converter like the MCP3008. Although this sensor also provides a digital pin that can send a signal as soon as a threshold is exceeded, however, it is not exactly determinable. The threshold can be changed by rotating the wheel (if it has been reached, the green light will be on). 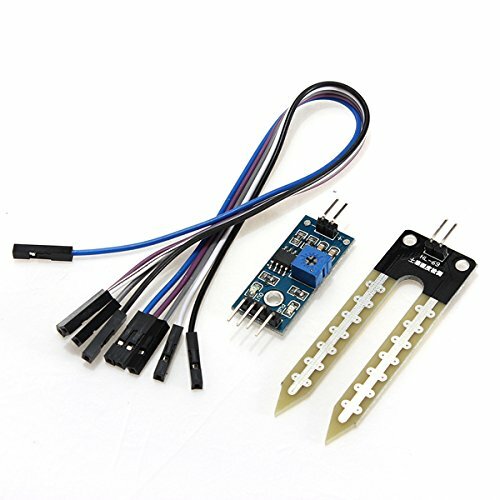 VCC of the sensor is also connected to 3.3V (pin 1) of the Raspberry Pi, GND and pin 6 (GND) and A0 comes to CH0 of the MCP3008. “8 Advanced Options” -> “A6 SPI” -> “Yes”. A value between 0 and 1023 is output. In my test, the sensor has often returned a 0, which would mean total wetness (conductivity). But since only values around 100-200 appear, if the sensor is completely submerged in water, a value of 0 is obviously wrong, so I filter this value in the script. In addition, values come out around ~ 1000 if there is nothing conductive (air) between the sensor plates. Depending on the material (earth, water, sand, etc. ), which is located between the plates, other values come out in the dry/wet state. Therefore, it makes sense to take multiple measurements and adjust the analog threshold for your application. Subscribe to Raspberry Pi Tutorials and don't miss any new Tutorial!